How conclusive is this evidence? Have you ever have seen a 15th century map? How can you tell if it's real? A "real" map would be consistent with other maps at the time. In the 15th century, some parts of the world were well charted, but much of the earth was unknown. One of the most recognizable portions of the map is the Mediterranean, and this to be expected. Examine below the geography of the Mediterranean. Detail from the Vinland Map, with modern-day countries colored and labeled. Note how accurate these contours seem. The 15th century was the high point of the Renaissance. The center of activity was Italy. Already, for over 2,000 years, the Mediterranean had been home to the Greek and Roman empires. Trade had flourished, the coastlines had been thoroughly mapped, and we would expect it to be fairly accurate. This area was called the "Mediterranean" because, at that time, it was the center of the known Earth: in Latin medi = center and terra = earth. To the northeast of mainland Europe, we find Iceland ("Islanda"), and Greenland ("Gronland"). Greenland is remarkably precise. Compare below the map's Greenland with a contemporary map. Compare the amount of detail of the coasts. Compare the overall shapes. 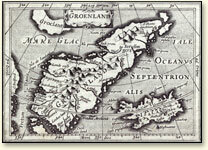 The Vinland map shows Greenland as an island, which is highly unusual for a map before the 19th century. Are these accurate? ... Are they too accurate? Could a 15th century cartographer known that? It was not until the late 19th century, with the invention of the steam-powered vessel, that a ship could survive the arctic conditions and travel around the northern coast. Greenland was first circumnavigated by Admiral Perry. In 1450, little was known about Greenland. Its shape was pure conjecture. Compare these other maps below. Greenland appears variously as a peninsula extruded from Europe, as a part of the arctic landmass, and occasionally as an island (with an inaccurate Northern coastline). Greenland as part of arctic landmass. "Poli Arctici," by Frederic de Wit. The Northern seas are known well north of Scandinavia and somewhat in North America, but the North of Greenland was unknown. 1675, Amsterdam. Greenland as an island. However, northern Greenland is fantasy. This is a polar projection from Septentrionalium terrarum descriptio by Gerardus Mercator, as published posthumously by his son in 1595. Greenland as a peninsula extending from Europe. Geographia of Claudius Ptolemy (ca. 87-150 CE), by Wilibald Pirkheimer. 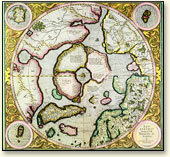 Ptolemy's map showed the inhabited world as it was known to the Greeks and Romans of about 100-150 CE. 1525, Nuremberg. Another island, from 1605 book by Petrus Bertius. The northern coast of Greenland (the Northwest Passage) is frozen most of the year with treacherous icebergs year-round . It defeated many explorers, remaining unmapped until 1903 when Roald Amundsen sailed around its north. To the west of Greenland is North America (Labrador, Newfoundland, Nova Scotia and New England). On the map we see an odd looking island, wuth two large inlets, labeled "Vinlanda" ... and this is what makes this map so famous. The presence of Vinlanda on this map (which has been dated to 1425) would be further proof that Columbus (1492) was not the first European to discover North America. Here is Vinland, as shown on the map, in comparison with the shoreline of North East America, as known today. 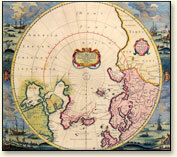 Detail of "Vinlanda" (left) and Greenland (right) from the Vinland Map. It is the only part of North America that appears on the map. Detail of North East America. The two indentations (estuaries) on the east coast of Vinland are shown in great detail. Can they be identified today? Vinland is shown as an island, with a large bay on its western shore. 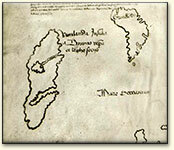 Given the detailed mapping of Greenland on the Vinland Map, what can one conclude about the mapping of Vinland? The detailed mapping of the Vinland shoreline is not schematic but specific. Specific bays and promontories are indicated. What conclusions follow from these?